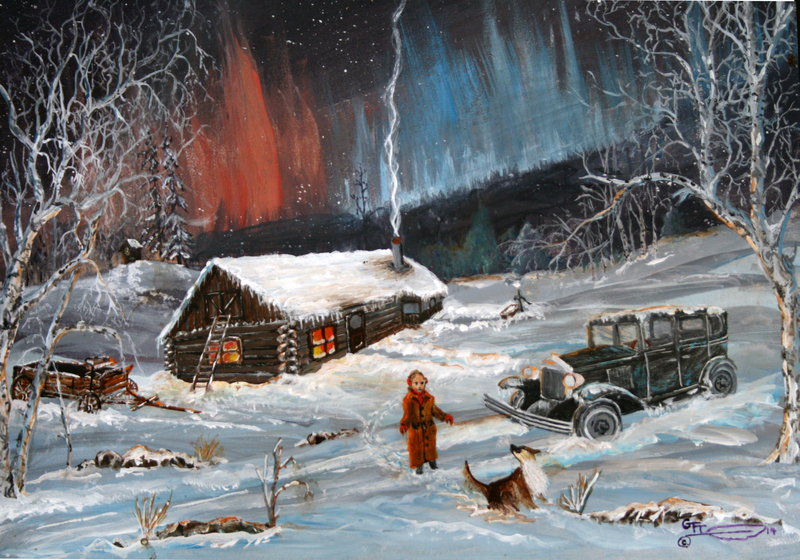 This entry was posted in Musings, Original Western Art and tagged art, childhood, dog, home, memories, northern lights, nostalgia, painting. Bookmark the permalink. Oh ! I love it too. Its such a warm painting. Thank you for showing it to us. Rita, thanks so much for stopping by and leaving such a nice comment. I was really happy to see you posting another painting! They always warm my heart, and I appreciate your reflections you always include with them. Texas Tom, you made my day. Thanks for such a nice comment. I am completing my first landscape ever and I want you to know how much more I appreciate your paintings because of it! I have always loved your work but now I have a totally new take on the entire process! Thank you as always for sharing!! I’m looking forward to seeing that completed landscape and really appreciate your taking the time to leave such a nice comment. I just thought you should know that I posted my first landscape yesterday! It was a tough one! Just checked it out, and what a wonderful painting. I’d like to just step into that scene and enjoy a relaxing afternoon under the tree, with the horses. Thank you! And yes, I think it is the tree that evokes a sense of calm and peace! Thanks – have fun with the snow scene. :). There cannot be a better feeling than a piece of art you loved creating, and the emotional response you received from your client. Wonderful and congratulations. Thank you – you are so right. This is fabulous, Trapper. You must be so proud to be able to make someone’s memory come to life on canvas. Thanks GP, I was definitely happy that she loved it. Question: Do you paint from your memory and/or imagination, or by using reference photos (or other art pieces) as inspiration, or perhaps some combination of these? I’m curious to find out your creative process. Tom – it’s a combination of all of the above. A lot comes from my imagination, but I use references to help get the details right. I love history, particularly history of the American West and like to imagine what might have been. Thanks for asking. Very nice painting. Nice to see you again, Gale. I wax nostalgic all the time it seems. I prefer it to the stark cold reality I read about in the daily morning paper, lemme tell ya! Hey Man – Wow … this image captures my soul … Great work! I think I’m going to go ahead and reblog this good post. I like your words, incidentally, not only the painting. Thanks… you made my day! Oh my goodness! This is beautiful. I like the color bursting in the background and who can’t relate to a girl and her dog. I would love to see the northern lights. A lovely painting….I was just rereading about your surgeries and health challenges. I hope all is well now! Sunny Sunday! Thank you for your comment and concern. Unfortunately, I am still facing some health issues, which have slowed me down considerably, but… such is life. I hope to be back in my studio soon, so we’ll see. That’s a great painting. And I know what you mean about nostalgia. It’s something I struggle with. I find myself thinking about the past too much sometimes and I’m afraid I’m not appreciating the present. Thank you. Nostalgia can be great, but we need to live in and appreciate the here and now, don’t we? I love this, well done!! You really capture a time past, before plows and curb cuts and four-wheel drive. Thanks Brenda… perhaps it’s because I remember them! :). Hi there. Today is March 24th. I keep checking looking to see if any recent treasures have been added. I hope you are well my friend. Thanks for the concern. This year has been challenging – filled with health issues, so I haven’t been around much. I haven’t hit the studio at all yet, but hope to soon. Hope all is well with you. I send a warm embrace and positive energy for healing. I look forward to more of your work. Thanks so much for your kind words, you’ve made my day! And seeing your work makes mine. I love that it’s always educational, as well as beautiful to behold. Beautiful Painting, you have your own style.. I so love the far background.. Thank you, I appreciate your nice comment. Good to see you’re still around, Trapper. It’s been over 2 months since your last post. Yes, it has. Been a rough start to my year, but I’ll get back into it soon, I hope. Still enjoying your posts, though. Alright is relative, I guess. Facing some major health challenges, but it could be worse. As you write in your posts, others have faced far greater challenges. All the best, Trapper. I’ll be thinking of you. Thank you Anne, I appreciate the kind words.